The Fight Cauldron is a minigame deep in the heart of the TzHaar city, unlocked after completion of the quest The Brink of Extinction. The aim of the Fight Cauldron is to survive for as long as possible. Unlimited waves of powerful TokHaar creatures spawn in an attempt to snuff out your light. To make this even more of a challenge, the 3x3 squares of the arena begin to glow and start burning, and standing on them causes constant, high damage. This minigame is about your ability to survive, adapt, and test your wits. Let's get started. 1. Using the two legs you were created with, you could walk there. The entrance to the TzHaar city is located at the top of the Karamja volcano, which can be accessed by taking a boat from Port Sarim. 2. After starting A Fairy Tale: Part II, and unlocking fairy rings, you can use the one by the fight pits for quicker access to the TzHaar city. The code is B L P.
3. 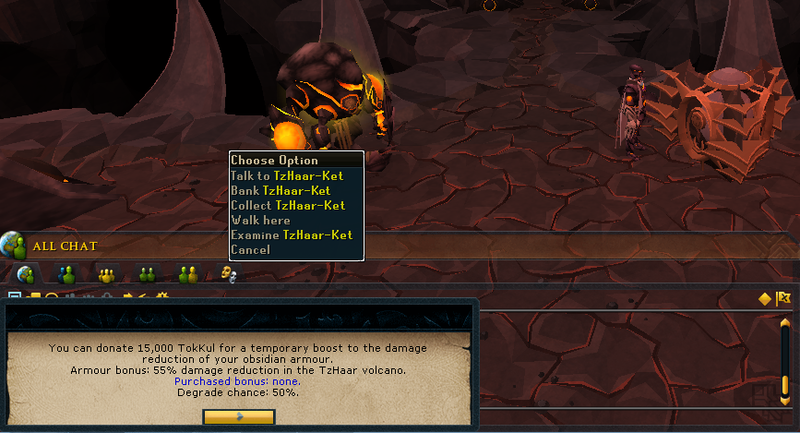 Using the Tokkul-Zo awarded from The Elder Kiln quest, presuming it has charges, you can teleport directly to the entrance of the Cauldron. After entering the cave, you arrive at a small lobby in front of the arena. There is a banker here to help you prep for the Cauldron, along with a coffer that you may donate 15,000 TokKul to the increase the damage reduction you receive from your Obsidian armour. 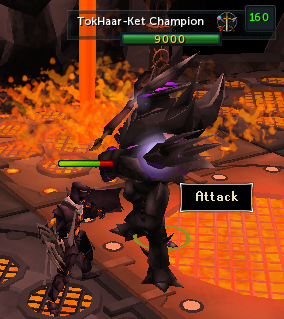 The Fight Cauldron is 100% combat based, just like the other minigames hosted by the TzHaar. So, unless you have obsidian armour, you will need your best gear in all 3 combat styles. 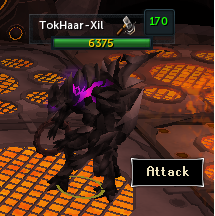 Malevolent> Superior Tetsu > Tetsu > Torva > Bandos/Barrows gear. 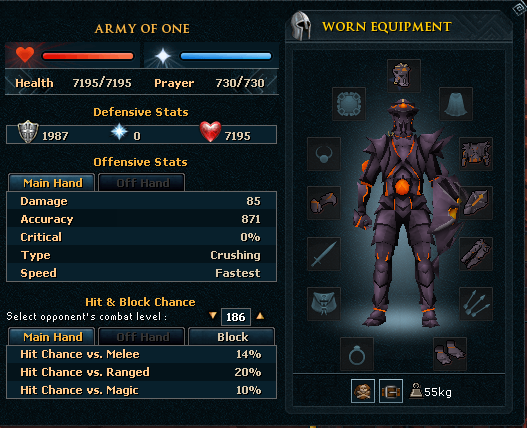 Dual Drygores > Dual Chaotics > Saradomin Sword/Godsword/Zamorakian spear > Abyssal whip paired with Enhanced Excalibur. Sirenic> Superior Death Lotus > Death Lotus > Pernix > Armadyl/Karil's gear. Dual Ascension Crossbows > Dual Chaotic crossbows/Royal Crossbow/Zaryte Bow > Hand cannon > Dual Karil's pistol Crossbows/dual Blisterwood stakes/Karils Crossbow. Tectonic armour > Superior Sea Singer > Sea Singer > Virtus, > Ganodermic > Robes of Subjugation/Ahrims gear. 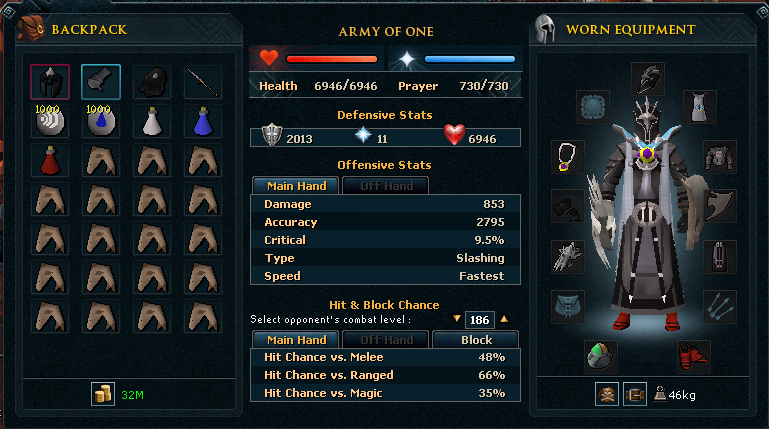 Dual Seismic Weaponry > Chaotic Staff > Armadyl Battlestaff > Staff of Light > Ahrims wand/Wand of Treachery paired with Ahrim's book. Skillcape: These offer a 2.0% crit across all styles, and offer 33 armour. They also have a small prayer bonus of +2. Cape of Legends: This cape offers a 1.6% crit across all styles, offers 11 armour, and has a Lifepoint boost of 100 health. Soul Wars Cape: This cape offers 18 armour and a hefty +5 prayer bonus. Superior Reefwalker's Cape: This cape, available from player-owned ports, offers a 1.5% crit across all styles, 207 armour, and a 400 lifepoint boost. Dragon Rider Cape: This cape, offering a meagre 29 armour boost, has only one main attribute to making it worth considering: a whopping +10 prayer bonus. If you are planning on being prayer-dependant, this could be very useful. Max Cape: Offering a 2.2% crit across all styles, 44 armour, and a +5 prayer bonus, this is a very good choice if you have one. Completionist Cape: If you have this, A. Props to you, and B. Use it. This Cape has the best stats over every field of all the capes, be it crit, which has 3% crit across all styles, 207 armour, 400 Lifepoint boost, and a +6 prayer bonus. For Gloves, use the highest Culinaromancer Gloves you have, or the Warpriest of Saradomin / Zamorak Gloves. For Boots, some hybrid Boots include Dragon Rider and Warpriest of Saradomin / Zamorak. Other Boots that can be used include Ganodermic, Bandos, Dragon, and Armadyl. For Rings, there are a few worth using. If you have Onyx Ring (i) use it. If you don't have that, but have a Sixth-Age Circuit, use that. And if you have neither of those, just use your Tokkul-Zo. Make sure you recharge it every so often after use. Any gear below these levels will not be of high enough tier to survive for long enough in the Cauldron. However, if you use a shield, and are good with defence abilities, armour such as Void Knight could be used, which is helpful as it is very easy to hybrid with. 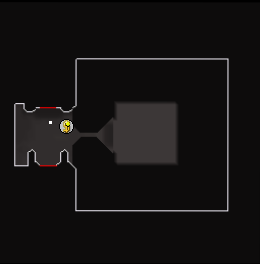 You will need at least a Chaotic weapon or Virtus wand to pair with a shield, as a whip/Karil's pistol crossbow/Ahrims wand will not deal enough damage. 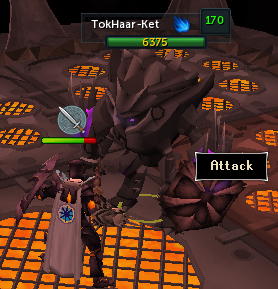 Malevolent kiteshield > Divine Spirit Shield > Chaotic Kiteshield > Blessed Spirit Shield/Dragonfire shield (melee)/Bandos warshield. 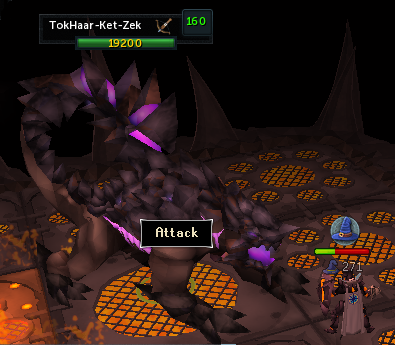 Vengeful kiteshield > Elysian Spirit Shield > Eagle-Eye Kiteshield > Armadyl's Buckler/Dragonfire shield (ranged). Merciless kiteshield > Arcane Spirit Shield > Farseer Kiteshield > Ward of Subjugtion/Spectral Spirit Shield/Dragonfire shield (magic). Your inventory should consist of your armour, weapons, food and potions. One Prayer Renewal and Super Set should last you through until you either exit or die. Fill the rest of your inventory with the highest healing food you have. You'll need it. Do NOT let yourself get caught by the glowing floor. 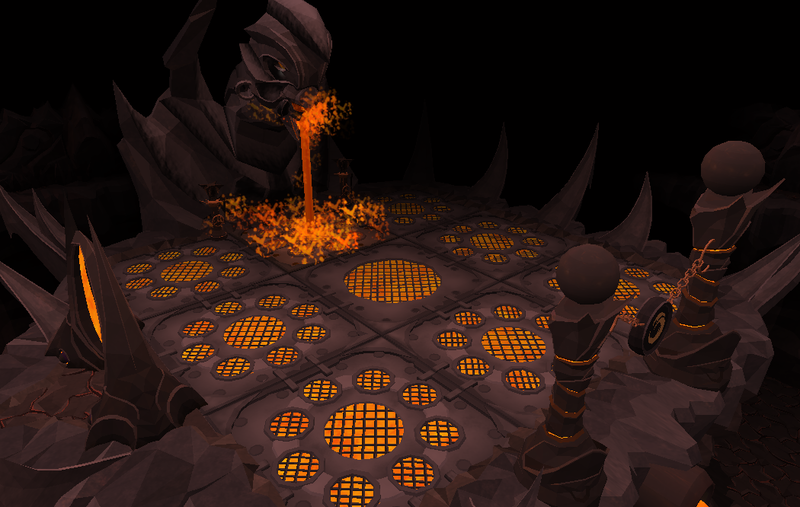 The floor tiles that are glowing orange will deal high damage at a constant rate if you stand on it. 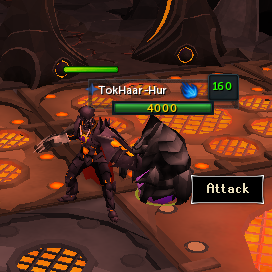 When TokHaar monsters spawn, the tile they spawn on will still be very hot for a few more seconds. Do not rush straight towards the monster to great them with a friendly stab, but wait a few seconds until the tile cools down. Then it is safe to attack the monster. This only applies if you are using melee: If you are ranging or maging, you will be attacking from afar, negating this somewhat. Even so, ALWAYS be looking at the ground while you kill monsters: it could heat up beneath you without you realising, wasting valuable supplies, or even killing you. This is where you will be fighting wave after wave of TokHaar. Monsters will periodically spawn out of the tiles after finishing each wave. Some monsters are relatively weak, while others will bash you around like a rag doll with ease. Be prepared to take heavy damage from all corners of the combat triangle, but be even more ready to dish some out to each corner. TokHaar-hur are small, sphere-shaped monsters, more designed to be crafters than warriors. They are very simple to dispatch, just whack at them until they die. They attack with melee. They have 4000 Lifepoints, are level 160, and are weak to Water Spells. They can spawn in groups of up to four, but sometimes you will encounter just one. TokHaar-Xil are moderately powered rangers that throw obsidian rings. They are not too hard to kill, but watch out, as you may take heavy damage as you kill them. 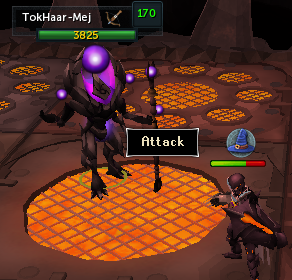 Pray against ranged and attack with melee. These monsters have 6375 Lifepoints, are level 170, and are weak to Crush. Resonance is a useful ability to use here, as you can heal from the ranger's hit while you wait for the tile beneath it to cool down. These monsters are standard melee monsters that attack you with an Obisidian mace. These are quite easy to kill with melee, but easier with magic. They do not hit too hard, but if there are no other monsters around pray against melee. These monsters have 6375 Lifepoints, are level 170, and are weak to water spells. These monsters are mages that will attack you from afar. They have a high defence against melee, so it is not recommended to be used against them. Resonance is also a useful ability here. Pray against magic. These monsters have 3825 Lifepoints, are level 170, and are weak to bolts. These monsters are a powerful creature in the Cauldron, capable of hitting into the 1000's with both melee and ranged. The resonance ability is very useful here, being able to heal high hundreds or even a thousand off of the enemy's hit. They have 13800 Lifepoints, are level 170, and are weak to Crush. 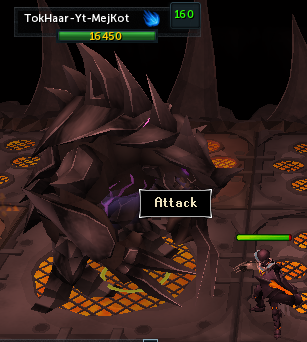 Pray against ranged when facing these creatures from afar, or melee when up close. 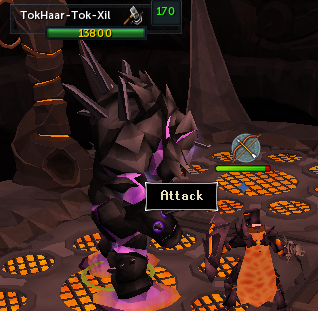 TokHaar-Yt-Mejkot are huge monsters that attack with melee. They are very resistant to melee, and even more so to ranged. Attack these with magic spells. They have 16450 Lifepoints, are level 160, and are weak to water spells. TokHaar-Ket-Zek are VERY dangerous monsters found within the Cauldron. Do not underestimate these giant dogs. Protection prayers can slightly reduce damage, but it will still hit you for constant high damage. These need to be killed as fast as possible to stop them chewing through your supplies, so immediately swap to your ranged gear and kill it. Unload the highest damage abilities you have, Thresholds as soon as you get them. Resonance can be a big help here, as they hit hard. These monsters have 19200 Lifepoints, are level 160, and are weak to bolts. The TokHaar-Ket Champion is a unique monster in the Cauldron. This monster is special in that it has no weakness. So, destroy it with your preferred style. A good way to quickly remove a champion from your worries is to build up enough adrenaline for a threshold ability. As soon as you get enough, warriors should activate Assault. Rangers should activate Rapid Fire. Mages should activate Asphyxiate. This will kill them quickly. these monsters also have an ability in which every one or two hits they will drain a small portion from your prayer points. These monsters have 9000 Lifepoints, are level 160, and have no weakness. When using the Resonance ability, you can heal more by turning off your protection prayer for a small time. Doing so will cause the monster to have a stronger hit, but will instead heal you more. Another trick is to stay above half health. One mistake can lead to a death, such as getting burnt by the floor while fighting one of the more challenging monsters. Having a decent amount of health to help out in one of these situations is essential. Have a good action bar setup. Memorize it. A good idea is to set up three different bars: One for melee, one for ranged, and one for magic. Remember the number of the bar that you have put them on. A swift way to change action bars is to press shift and then the number of an action bar, and it will swap to it instantly. This can help killing monsters while changing styles constantly. 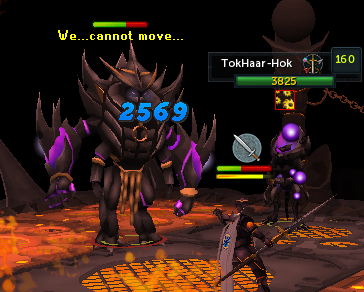 The use of the abilities Rejuvenate and Guthix's Blessing can be very helpful. Always use them if you have enough adrenaline and they are cooled down. At the end of every wave, use the Regenerate ability, which transforms extra adrenaline into health. You can use the Berserk ability to become much stronger in melee temporarily, but do so at your own risk. Your armour rating is halved and you take double damage until the affect wears off. This can lead to very dangerous situations if surrounded or fighting a Ket-Zek. If you are being attacked by multiple monsters, the Reflect ability can rebound damage to each of them while you pick them off one by one. The monsters will slowly damage themselves as they attack you and will have less Lifepoints when it is their turn to get annihilated. If you leave the cauldron, the monsters will die, but drop nothing and give no XP. When you re-enter the Cauldron, the same monster/s will respawn. However, if you die, it will start a completely new wave upon returning. Stock up on supplies. One inventory of food will not last you long. Buy a large supply of food and potions before venturing off to the Cauldron, as this will prevent multiple trips back and forth from the Grand Exchange. 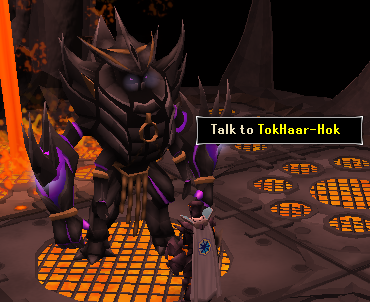 Tremble in fear, TokHaar-Hok is here. If you do not remember him as the boss fight from The Brink of Extinction, he is the toughest monster in the cauldron. When he appears, you must first talk to him and either accept or decline his challenge. If you decline, he will call you a coward before sinking into the lava and spawning a new wave. If you accept, he will chuckle, claim he is going to enjoy this, and then begins the fight by taking a big swing at you. BEFORE accepting his challenge, have your magic gear on and protect from melee on. He can smack you for multiple thousands of damage in one hit, so protect from melee is essential. He also drains prayer like the Champion. As soon as the fight begins, stun him with the ability Impact, and step backwards. Attack him as normal until the stun wears off. Use Impact again if it has recharged. If it has not, use Asphyxiate. He will begin to spawn minions to aid him. If you do not stun him as he walks towards the lava fall, he will heal for a large amount of Lifepoints and then continue the fight with you, so stunning him is essential. Upon death he will drop an antique lamp worth 20k XP in either Attack, Strength, Defence, Ranged, Magic, Constitution, Prayer, Herblore, Summoning or Slayer. TokHaar-Hok has 45000 Lifepoints, is level 160, and has no weakness. Soft Clay, from the Tokhaar-Hur. Obsidian equipment, such as staves, mauls, maces, swords, and rings. All drops other than obsidian equipment either stack or are noted. The main reward from the Fight Cauldron is the Obsidian shards that the monsters drop. Shards are automatically picked up during the fight. When you leave, you will be awarded all these shards in one go. However, if you die, the amount of shards you would of gained is sliced cleanly in half, rounded down. This is why surviving is key. At level 80 Smithing, 12 Obsidian shards can be used to create an Obsidian bar. This adds to a total of 55%. 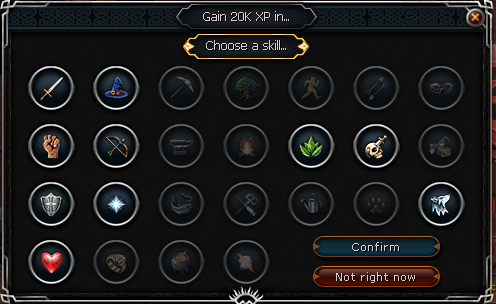 Note that the Smithing requirement can be assisted. That's the Fight Cauldron. A very fun and entertaining minigame designed for keen fighters. Don't get killed, don't stand on the lava, prepare correctly, and it will be a piece of cake. The drops can add up to quite a profit as well. If you die trying to get your obsidian armour, don't give up, you will eventually get it. As for TokHaar-Hok? As Thok would say, TokHaar-Hok weaker than Thok. But he's also weaker than you. Good luck.